PinkRules wrote: I remember this tosai and her few bulky siblings. Love the progress she has has made so far. The skin and beni are looking beautiful. Her diakon conformation actually got better as she seems to grew length proportionally. The gamble paid off. Watching this Sanke grow has been a good learning experience for me as well. I bought a tosai with daikon body last year to experiment. 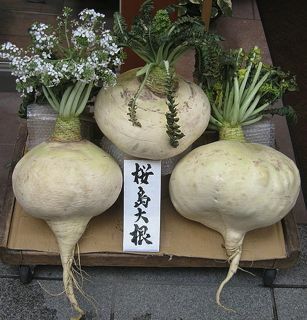 I am afraid that mine could be this daikon variety. PinkRules wrote: I bought a tosai with daikon body last year to experiment. I am afraid that mine could be this daikon variety. I hope she doesn't end up like those radishes. I'm glad you folks enjoyed the thread. Btw, my dear friend bought one of these koi, too. Actually, I think she has two from this lot but the one I'm thinking of would be a great koi to show how patterns that are asymmetrical can really pull together as a koi matures. I'll have to ask permission and track down the progress pics but she would be well worth it. What does Taniguchi feel about future development of sumi? Time frame? I am glad you posted this sanke so we can see the sumi rising over the years. Many koi people want the instant gratification and that is ok. But the koi enthusiast should have one or two quality koi that take years to blossom. For me this is the exciting part of the hobbie as the koi continues to develop over the years and enjoyable to watch. However sometimes it does not work out so well but just part of the hobby. I guessing another 3 years or more on this one. But really don't know. I'm not privy to any lengthy discussions about her. I think you may be right on the time frame but only the koi knows for sure. The funny thing is, when I was pulling together the pics for this thread, I stumbled across an INC Matsunosuke Sanke I purchased on the same trip. They give a similar impression though the INC lass has more beni pattern. Both were kind of unconventional choices but both koi have done well thus far. I remember some years ago I purchased an expensive tosai from Russ that was in one of his grow outs. He had a 3 step sanke tosai that I purchased on a whim as I figured if I was going to make the trip to the grow out. I might as well come back with two tosai. The sanke only had a couple of black scales on the last step. I gave it away to a friend and told her not to get rid of it as more sumi would probably come. the first year she had it, nothing. She was going to move the koi but I pleaded with her to keep it. she did and over the next couple of years the koi ended up with quite a bit of sumi and looked good. She had moved to Washington and informed me the koi even improved some more and she was quite excited about him. I asked her to send a pic and she said she would in the spring. Unfortunately it was there first winter in Washington and she was not prepared. She lost the koi as well as a few others. Kinda ticked me off as I wanted to see the koi sumi develop. Also I had warned her about winterizing her new pond but she chose not to. That is a shame she lost him. To have moved all her koi up there and lose them her first winter must have been tough. Some lessons have to be learned from experience instead of warnings from others. I finally took the time to download the video Russ sent to me of her.